GrabIt Review - Download And Tutorial - A Good Program? GrabIt is a free newsreader for PC / Windows, and has all the features most people need to download binaries from Usenet with ease. It supports SSL encryption, NZBs, automatically repairs and extracts your downloads, and all the other good stuff, like automatically shutting down your computer after completing its job. You can use GrabIt in the simplest way possible, which is just creating an NZB from any search engine you like and letting it do its job, or the build-in search engine. Some old-school Usenet users might enjoy header support, allowing you to manually browse through groups, and the posting feature for text groups, if you’re among the good folks who use Usenet for discussions. Backup servers are supported, so if you’re more of an experienced user who likes to add a secondary server, you can do that too. All in all, a good newsreader for everybody. The only downside is that Internet connections with more than 100 Mbps are not always maxed out, due to inefficient usage of the hard drive. We hope this will be fixed in the next version. Available since the fall of 2004, GrabIt has been around for over 10 years now, and is still one of the most recommended newsreaders. One of the reason for this popularity is that it is completely free, except for some special search features we’re going to discuss later on. Developed by Ilan Shemes, it has been updates ever since. The current version at the time of testing is 1.7.3 beta. So, let’s dive right in and see how GrabIt is holding up in 2015. This is pretty straightforward. You can get the software on the official website at Shemes.com, where a big “Free Download”-button leads the way. Currently, the software is only available for Windows, and works fine with the latest version, Windows 8.1. A Mac-version is “still a work in progress” and will come with the all-new 2.0 version. 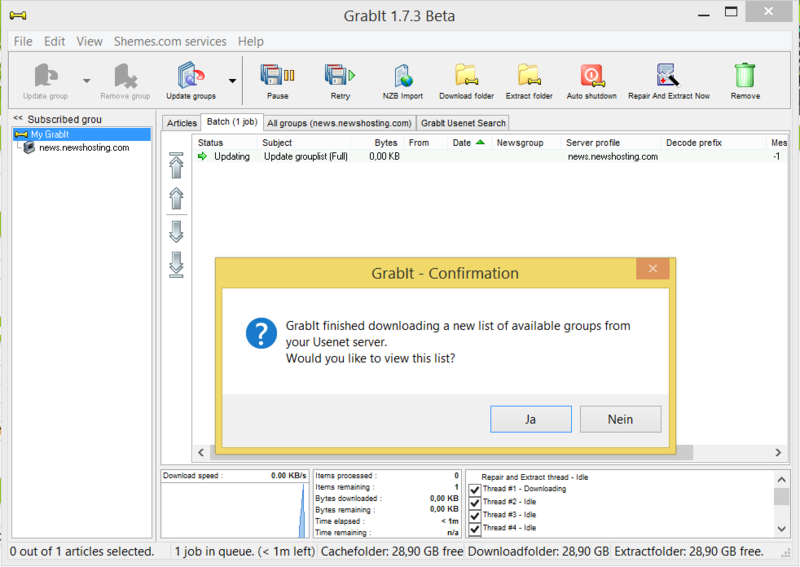 After downloading and running the installer, which does not contain any adware or additional offers by the way, GrabIt asks you for your Usenet server information, such as server address and login credentials. After entering this information, which you get from your Usenet service after signing up, the software does a quick update of its newsgroup database. Click on “No”, and GrabIt will be up and ready to use. Note: If you don’t want to use GrabIt as your primary newsreader, uncheck the box in the installer titled “Associate GrabIt with NZB files”. 2. Features And Usability: How Easy Is It To Use? 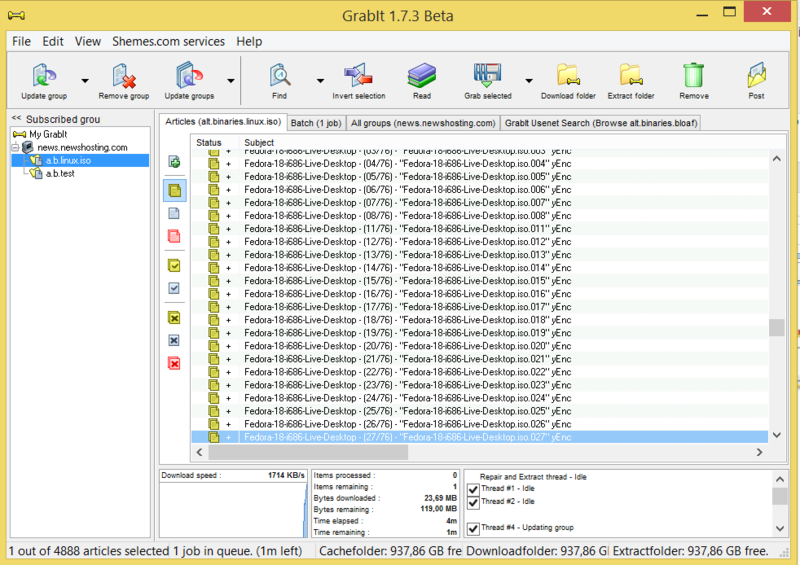 Right from the start off, GrabIt can be used as a “normal” Usenet downloader as is common today. You can simply doubleclick an NZB file within Windows, and the software will automatically open and ask you to confirm. Click “OK”, and GrabIt will download the files, automatically very and repair them if necessary, extract them, and present you with the downloaded material, all ready to use. This kind of automatic processing is very common these days, and GrabIt handles the job just fine. You can also choose to manually import an NZB from within the client by clicking “NZB Import”. We would like to point out that the interface feels a bit crowded: Some other newsreaders, like for example, the Newshosting newsreader, feel more clear. SSL for encrypted downloading, secondary servers, and even automatic shutdown of your computer after downloading and processing is finished are also included. But there are a number of other features that might come in handy. Most notable are two of them: The ability to manually browse through newsgroups. In the old days, people downloaded the so called headers, which are lists of all posts and content in a newsgroup, and looked for new content. This works quite well, will all the inconveniences of having to download the headers, which might take a while, especially for large groups. Many of them are so large GrabIt has to limit the amount of posts it shows you, so we recommend you use NZBs or Usenet search engines to find your content. 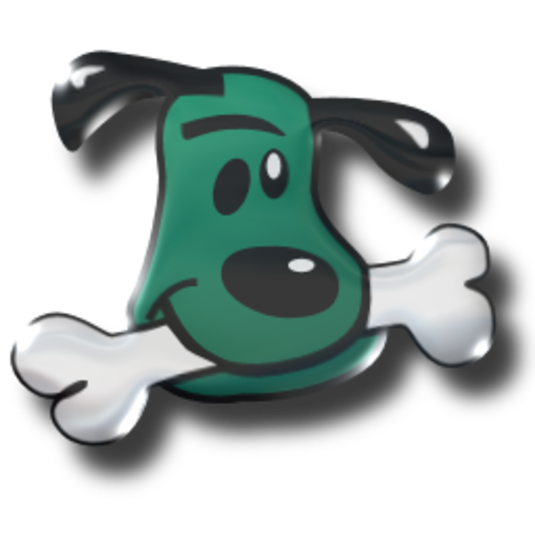 Unfortunately, GrabIt doesn’t recognize file groups, so one post, made of dozens of RAR-files, will be displayed as a whole bunch of files. Some other, more mordern newsreaders handle this more elegantly, and also show you more information such as the content of the NFO-file and even a sample. GrabIt Usenet Search: How Does The Build-In Search Feature Perform? And than there’s GrabIt Usenet search, a feature that allows you to browse through newsgroups or search through all of Usenet, all from within the software. This works quite well, although the free version only shows a very limited number of results, and is limited to a relatively short timespan: Older files are not found. You can get a much higher “retention” for search results and up to 10,000 results per search by subscribing to the service. Prices start at about $1.7 per month, so if you like the feature it might be a good investment. Like with regular newsgroups browsing though, we’d really love it if files could be shown as file groups, and not separately. 3. Downloading Speeds: How Well Does GrabIt Handle Very High Downloading Speeds? Modern Internet connections come with very high bandwidth, sometimes so fast computers and Usenet clients have a hard time coping with the amount of files put through. Especially with our very fast connection, which offers more than 150 Mbps download speed (chances are your connection is much slower), sometimes programs are not fit to handle it. So we tested GrabIt on two different hard drives: Our SSD, which has a very high transfer rate, and the additional hard drive, which has more space but is a lot slower. For all tests, we used 30 connections, which should be enough to max out all of our speed. Find out about our testing equipment here. In this test, GrabIt averaged at about 110 Mbps. Not bad, but other newsreaders can use the full potential of our setup. So, decent speed, but unfortunately only about 70% of our bandwidth. Here, GrabIt had to use our secondary, regular notebook hard drive, and fired up a test download again. Here, we had several, complete drops, because the drive struggled to keep up with all the data. We had this problem on our old testing notebook, but never with this one, so apparently it is GrabIt that isn’t handling disk usage appropriately. Speed averaged at about 94 Mbps, about 62% of our maximum bandwidth. Therefore, this version of GrabIt doesn’t seem to be optimized for very fast connections. Hopefully, this will be fixed in the future! GrabIt is still a very capable newsreader, and is suited for almost anybody, from total beginner to more advanced user. We would have liked it to handle very fast connections better, things are a bit messy, and the search and browsing features would to better if file groups were not shown as separate files. But this might be too much nitpicking. GrabIt handles downloading exceptionally well for 90% of users, and there is no reason to go for an expensive software if this is all you want from a newsreader. All in all, you should definitely give GrabIt a look if you don’t want to spend any money, because this is the biggest advantage of this software: It is completely free!